Aside from your home, your car is one of your most valuable assets. It gets you from home to work. You take your children to school in it. Without your car, you might not be able to do the things you do. So, shouldn’t your car have just a little protection? Ready Decks® can build high-quality carports onto existing structures inexpensively to get your car out of the elements. Using the best in treated lumber and metal roofing products, your new covered carport will stand the test of time as it protects your vehicle from the potential damage of storms, rain, and the harmful rays of the sun. 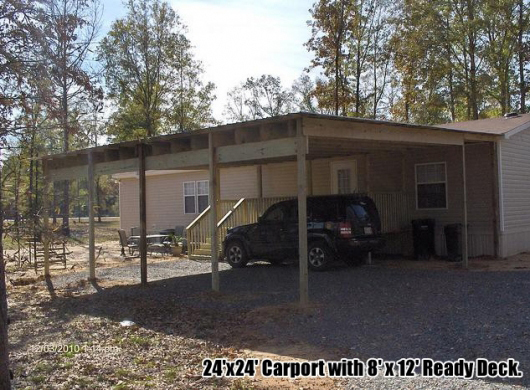 This product makes an ideal option for a mobile home carport. Check out our gallery of completed carport shelters linked below.